SuperJet International дал прогноз на 20 лет по сегменту 61-120 местных самолетов. Also this year SuperJet International provided a 20-year outlook for the regional market with a focus on the 61-120 seat category. SJI forecast is based on an economic model linking a region’s air traffic with the economy of the region itself. Regional traffic is moreover driven by many other factors (scope clause, right-sizing, natural growth, fuel efficiency). SuperJet International forecasts a demand for about 5,900 jets in the 30-120 seat market over the next 20 years. Jets in the 91-120 seat segment will account for about 63% of total deliveries with 3,700 deliveries within next 20 years. 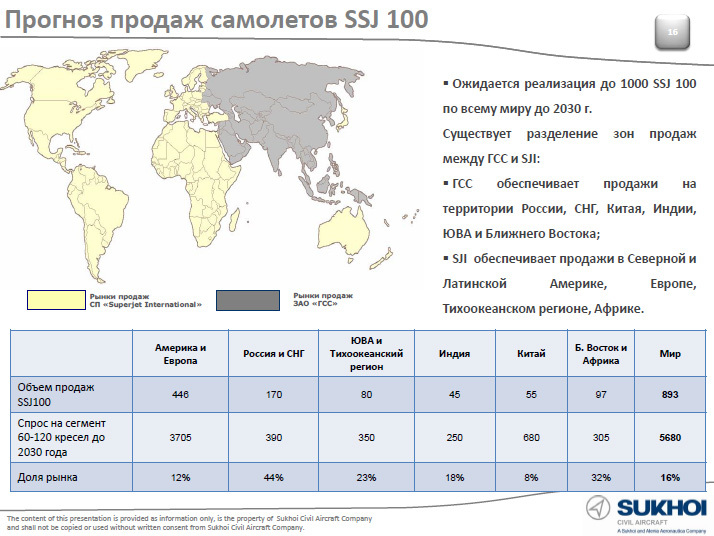 Они всё еще прогнозируют продать 1000 SSJ100 ?